The pink month, October is dedicated to Breast cancer worldwide. With all the pink ribbons all over in college, one should have guessed that the pinkness wouldn’t take long to touch Manipal University, Dubai, as well. Breast cancer is the most prevalent types of cancer, which in recent studies is found to strike one in eight women every three minutes, claiming thousands of lives across the world each year. We have all been touched by it, in one-way or another. The initiator of the Breast cancer Awareness week, Miss.Sheela Rani(left) and supporting faculty Mrs. Kalyani Ganesh (right). For the first time ever, the Biotechnology Department of Manipal University, Dubai has initiated and dedicated a week to an ailment from the World health organisation list of most prone diseases around the world. “ This year, the students have selected a timely disease that people are suffering from all around the world, especially Emirates. They are trying to create an awareness, here in campus, itself.” said Mrs. Kalyani Ganesh, professor in Biotechnology department and supporting faculty involved in the Breast Cancer campaign. 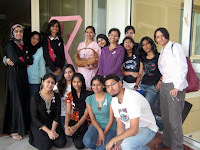 This year over fifteen students from the Biotechnology department took up the initiative in order to raise Breast Cancer awareness from October 16th to 23rd , 2008. The initiator and the originator of the idea for the awareness campaign, Miss. Sheela Rani, a first year of M.Sc Biotechnology said “We, as students are trying to do the best we can, in order to create awareness in campus as Breast cancer is becoming a more prevailing disease that is eating up lives just as we speak. We are trying to generate this consciousness not only in women but also in men, as they too are prone to breast cancer”, she also added that, being aware is important but so is reaching the message out to our community and by doing our bit and we can make a difference for those with breast cancer and those who are helping them fight the battle. The Biotechnology students have been actively raising awareness and reaching hundreds of students and staff across the campus in order to spread the message of hope, and encourage them to take the necessary steps in the fight against the disease. “Unlike the Health week, which is conducted every year which has several willing sponsors such as Al Rawabi, Islami Cooperation, Tiffany, Galaxy, Kellogs and Al Safeer but to our dismay, there was no response this year and we weren’t able to get any sponsors for this Breast cancer awareness student campaign” said Miss. 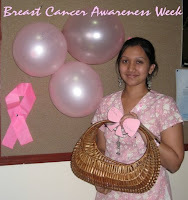 Sheela Rani, Initiator of the Breast Awareness week. The initiator and originator of idea of the Breast cancer Awareness week, Miss.Sheela Rani, holding the pink October basket filled with pink ribbons that are distributed among students. The Biotechnology department on the first floor has been decorated with pink balloons, pink crape paper and ribbons all shaped in form of the international symbol for Breast cancer. The students are also zealously promoting information dissemination to educate all students regarding early breast cancer detection, diagnosis and treatment. The key message being that we educate ourselves on the facts about breast cancer, do regular check-ups and talk to our family, friends and colleagues about it. Become and self-appoint yourself as the pink ambassador and help to save lives. Do not BUY pink ribbons. The pink ribbons that are being distributed are not for sale. The initiators who consist of the Biotechnology students have put in money in themselves and have not asked for any financial aid of any sort. “I was shocked, when I came to know that the pink ribbons were being sold for profit because our goal here is just the opposite, we are trying to create awareness about Breast cancer” said Miss Sheela Rani, initiator of the student campaign, she also advises all students not to fall to such trickery and warns them against buying pink ribbons. If any staff or student wishes to own a pink ribbon, in order to support the campaign further this week, they can collect it from the Biotechnology department, free of cost.